Barbara Gordon has always been an off-the-charts, just-forget-about-the-test super-genius and tech whiz, and then she gets the offer of a lifetime when Supergirl recognizes that Barbara’s talents make her an ideal candidate for Super Hero High. Donning the cape and cowl, Barbara Gordon becomes Batgirl, ready to train at the most elite school on the planet, next to some of the most powerful teenagers in the galaxy. She’s always had the heart of a hero… but now she’ll have to prove that she can be one. Good thing she loves a challenge! 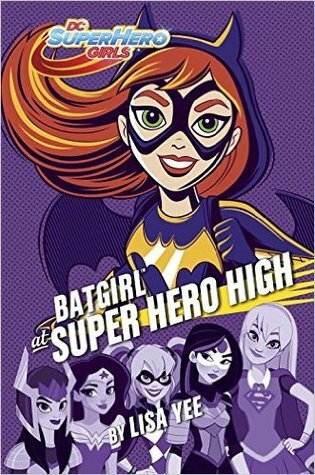 Batgirl at Super Hero High is all about girl tech power and I loved. I would have to say this is probably my favorite character so far. Although I am excited for Katana’s book too. Lisa Yee does such a great job with these books. I am loving this series because my daughter is a big superhero fan and it was hard to find things for her that appealed. She always liked the boy superheroes better because they had more action. Since this series has come out in all its forms she has absolutely loved it. I love that each girl has a special ability that shines through and being that I work in IT, well Batgirl is close to my heart. Hooray for the techie. I liked how Batgirl is a tech genius and has moved from the role of IT worker to Super Hero High attendee. The transition isn’t the easiest as she get’s used to her new persona and feels the need to prove herself to not only her classmate but to her father as well. All the gadgets she creates and works on are fun and interesting. She has to learn to deal with being in the spotlight and not taking on too much for other people. It’s basically finding a balance between her life and her Batgirl life. As well as dealing with her dad’s over protectiveness. The villain's name was cracking me up. I’m not sure why but it did. My son asked me the name and he laughed hysterically when I told him. Which I think is absolutely perfect. I also liked that the battle at the end is not a physical one it’s more of a mental one. I liked that Barta was included in the story and a little bit of her struggle to adapt from Villain world to the superheroes world. I also really liked how Batgirl is trying to get more freedom from her father but gets jealous when he seems to be investing in Barta. I think that happens often in families. I was really annoyed with Harley Quinn in this book. She was definitely being a bad friend but at the same time I was thinking in my head….well you know she is normally a bad guy. She might not be the best of friend at times but she’s not the worst either. I remember having friends like that where you were friends with them….but you wouldn’t necessarily trust them with the important stuff. I really enjoyed this installment of Super Hero High. I love how great these books are for my daughter and my son.